Signing up for the season must feel like a leap of faith for people new to CSA. What will I get each week? Is it a bunch of crazy stuff I don’t eat? Is it too much? Too little? The picture below is an example from early July last year and the mix of things changes throughout the season. 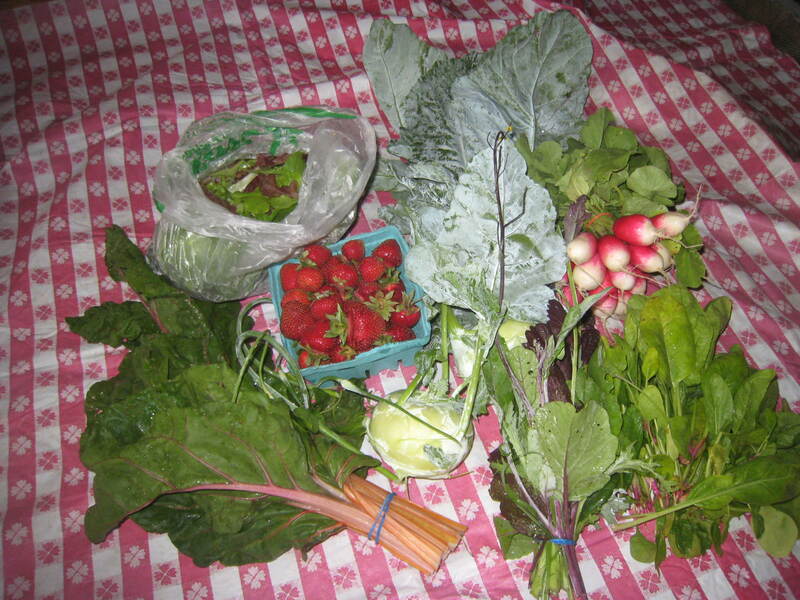 In early July we were still delivering early season stuff last year with salad mix, greens like chard, kohlrabi, radishes, braising mix, spinach, garlic scapes, and strawberries. We focus on growing all the staples, but also make sure there is a little surprise each week too. Many of our members tell me they like the CSA experience because they end up trying new things. That being said, I know people don’t want a box of only weird stuff, so the majority of what we grow are staples like lettuce, sweet corn, potatoes, tomatoes, peppers, and radishes. More details about the 2012 CSA season are found on the “Join our CSA” webpage.